In case you haven't heard, Occupy is back in the news and this time it doesn't have to do with protests, sit-ins, or police violence. And to the surprise of many, it seems that the potential for Occupy is actually growing, as the movement is working on at least two fronts, and certainly in terms of public relations, Occupy is scoring some points. The movement has shown the public a different side of itself through its relief efforts in the wake of Hurricane Sandy in early November. The hurricane resulted in extensive damage throughout much of New York City and New Jersey, so much so that the traditional governmental and non-governmental relief agencies have had difficulty responding to all the needs of those affected. "Occupy Sandy, as the effort has been branded, arose quickly in the aftermath of the storm, setting up local community hubs to dispense water, food and aid, and form groups to help communities pump water from their houses and clean up the vast quantities of rubble left in Sandy’s wake. Distribution centers have been set up in numerous locations in New York and New Jersey, and they continue to help those in need... While federal mobilization efforts can often take weeks—sometimes months—to reach citizens, Occupy was one of the only local groups capable of quickly mobilizing to help victims. Organizing volunteers and supplies is no small task, but Occupy Sandy has been able to generate a large amount of aid. On Sunday, Michael Premo, one of the volunteers, estimated the mobilization effort included 2,500 volunteers, 15,000 meals and 120 carloads of supplies sent to recovery sites." And while Occupy Sandy has put the spotlight back on the movement, there is still more to come. On a completely different, but definitely related front, Occupy is beginning its debt-relief efforts by launching the "Rolling Jubilee". The Rolling Jubilee, described as a bailout for the people by the people, is a project that aims to buy debt and forgive it. Sound too good to be true? Interestingly, it's an attempt at using the system against itself. And while it doesn't look like they will be able help specific individuals, the project promises to assist thousands of people struggling with their debt payments. The way it works is that the Strike Debt project will raise funds and begin purchasing debt, which is available for purchase at pennies on the dollar. What usually happens is a bank or lending agency who purchases the debt will then charge interest on it, earning back the debt and a hefty profit in interest. There is always the risk that the debt will not be collected, and that's why debt sells for pennies on the dollar. Strike Debt takes on that risk because it's not trying to collect the debt - it's simply forgiving it. These efforts are beginning to show some promise too. The project has done a test run and for $500 was able to purchase about $14,000 of debt. As the owners of the debt, they are legally able to do what they want with it, and they simply wrote it off. With this initial success, the project is now aiming to raise funds and begin purchasing more serious amounts of debt. They'll kick of the fundraising effort with a variety show and telethon in New York City, that has a number of big names participating. The show will include music, comedy, education, magic and more from an impressive list of contributors. Confirmed guests include: comedian Janeane Garofalo, Daily Show co-creator Lizz Winstead, actor/director John Cameron Mitchell (‘Hedwig and the Angry Inch’), comedian Hari Kondabolu, David Rees (‘Get Your War On’), Jeff Mangum of Neutral Milk Hotel, Lee Ranaldo of Sonic Youth, Guy Picciotto of Fugazi, Tunde Adebimpe of TV on the Radio and more. If you're in NYC, you can attend the live show. It will be held at Le Poisson Rouge on THURSDAY 11/15, 8 - 11 PM. Tickets are $25; each ticket will go directly to debt relief and buys $500 of distressed debt. 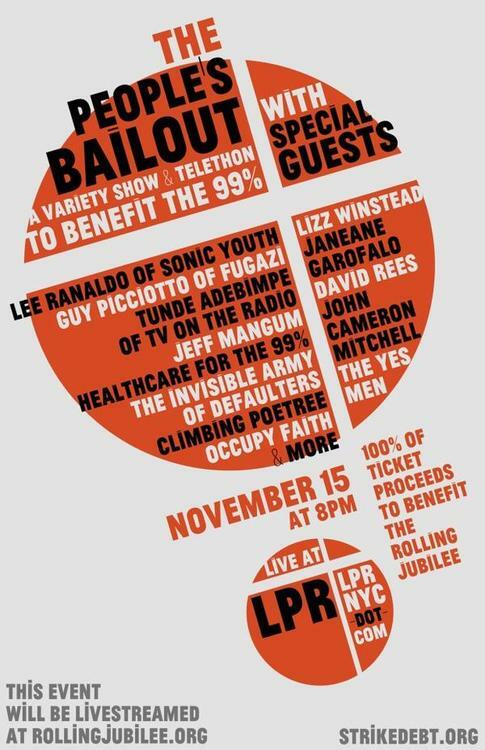 If you're not in New York, the event will also be live streamed at http://rollingjubilee.org, where you'll also be able to donate online. Labels: activism, economics, Occupy, U.S.